Tonight’s episode of The Americans contains two humongous developments of tremendous consequence for our favorite Soviet secret agents. The show has been building to these turning points for weeks (in one case) and years (in the other), and to see them play out on-screen is to see serialized storytelling at its very best. Just as TV fans still recall where they were when Luke wed Laura on Paige Jennings’ favorite soap opera, we will remember “A Roy Rogers In Franconia” for its twin colossi of Americans milestones. I speak, of course, of Paige Jennings’ first kiss and Matthew Beeman’s revelation that you can play a Commodore 64 through a standard television set. In all sincerity, it is great. “A Roy Rogers In Franconia” is another breathless chapter in what’s proven to be the best season of the best show on TV. No other ongoing series can match The Americans for its balance of long-term and short-term storytelling. Tonight’s episode achieves that all-important Peak TV goal—payoff—while also functioning as a compelling piece of standalone entertainment. It’s a sterling example of The Americans seeing the forest and the trees, wondering through its characters if working toward a greater good is worth all the personal sacrifices it requires. Paige Jennings is ideally suited for this type of quandary. Through her faith, she’s found solace and identity in something larger than herself. She’s protested nuclear proliferation and pitched in at the food pantry, but she’s still a teenager, so she’s not entirely selfless. She’s looking forward to the day when she can drive herself to school and church, and she has no patience for Philip and Elizabeth talking over her head. Paige is also too young and too protected to have seen all the carnage her parents have seen, which leaves her understandably shaken after the events of “Dinner For Seven.” Holly Taylor’s eyebrows get a real work out in “Roy Rogers,” cast in various states of fear, confusion, and frustration. What Paige wants is an honest explanation of what her parents do (and what they’re capable of), but the shock of the stabbing incident suggests that she might be overreaching. It’s a classic can’t-wait-to-grow-up scenario, which partially explains why she leaned in for that kiss from Matthew—and why she’s so quick to head back across the street. The most valid of Paige’s concerns opens the door for a “Roy Rogers” motif: People asking questions, but never getting the answer they wanted. It’s especially vexing in her case because Elizabeth and Philip tend to respond to inquiry by turning questions back on the questioner. When they do provide an answer, it’s either hopelessly oblique (“How did you know how to do that?” “I was trained to defend myself”) or meaningless sloganeering (“It’s always ‘I want to make the world better or safer,’ but it’s never what happened, never the whole truth”). Philip’s candor at the end of the episode is a big step, but it’s preceded by Elizabeth letting Paige in on her KGB origin story, a stunning Keri Russell monologue that pulls us back to Smolensk in the wake of World War II. “Dangerous didn’t matter” she says of the Soviet resistance fighters who inspired her into service. That’s an Elizabeth Jennings credo if I’ve ever heard one. Director Chris Long makes a bold choice in one of the early “Roy Rogers” question-and-answer sessions. Most of the episode’s conversations are shot over-the-shoulder, but as Paige and Elizabeth dissects the assault, the camera focuses not on the speaker, but the listener. So much of what follows this conversation deals with Paige’s emotional fallout, but with Keri Russell’s face as the focal point, these few frames—from “He was just…” to “You killed him, Mom”—give Elizabeth her own space for reflection. It’s an affecting way of showing that there are some things the KGB didn’t train the Jennings for. When mother and daughter later indulge in some playing-hooky daytime TV, it’s Elizabeth who struggles to grasp what’s going on. “It’s not logical, it’s emotional,” Paige explains. That’s selling General Hospital a little short—the machinations of soap-opera plotting require a hearty internal logic—but it’s still a nice wink to The Americans’ audience. In TV, logic and emotion aren’t mutually exclusive properties, as “A Roy Rogers In Franconia” attests. It’s both a touchingly emotional episode and a cruelly logical one, in which feelings feed the Rube Goldberg machine that produces the episode’s dual cliffhangers. And in that line of work, you can’t overlook the details. Aderholt’s conversation with the machine-shop owner illustrates the care with which the Jennings’ staged Betty Turner’s death: It looked enough like natural causes that the family ordered neither an autopsy nor a follow-up investigation. But Aderholt isn’t so easily persuaded, so he oversees the dissection of Mail Robot (Mail Robot! No! It’s “Robot Rumpus” all over again!) that yields a recording device and the sting operation that gives the episode its title. Mail Robot becomes so crucial to the season’s climax that it’s no wonder we didn’t see more of the guy earlier in the season. He had a greater role to serve, as the needle in Agent Aderholt’s haystack. From there, it’s off to the races. Oleg’s information trumps the Mail Robot sting. Gabriel and Philip have their sit down with William, and Gabriel sits down on the steps to illustrate the personal cost of the bioweapons race. Matthew drives Paige home, Paige demands answers over groceries, Aderholt gets off the phone with the Louisville field office. Once the machine has all of its parts, it operates with jaw-dropping intensity. 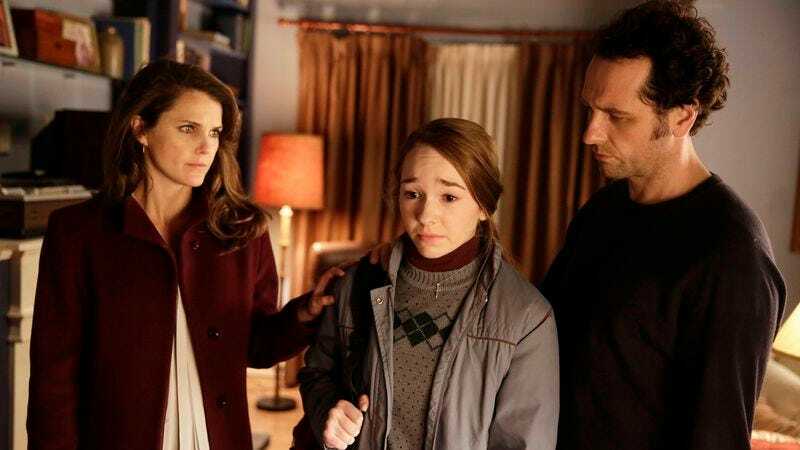 The Americans Wig Report: Season Four, Week 12: C+. An encore appearance from Philip’s Walter White getup. Walt would definitely give Philip a dressing down for not reading up on lassa. The Americans Soundtrack Report: Season Four, Week 12: N/A. But I do have an update on the hymn from last week’s episode: Twitter users @tenenhouse and @pacifictimezone correctly identified the song as “Down In The River To Pray,” which you might remember from O Brother Where Art Thou. Was there any Mail Robot? Please, please tell me now: Does Mail Robot know what he’s done? Does he possess the proper balance of emotion and logic to comprehend the trouble he’s causing the Jennings? The Jennings weren’t the ones who sent him to the repair shop in the first place! Here’s an amazing Easter egg: When Paige and Elizabeth tune in to General Hospital, they’re watching a scene between Brian Patrick Clarke and Sherilyn Wolter as Port Charles lovebirds Grant Putnam and Celia Quartermaine. But there’s a twist: Grant isn’t Grant at all! 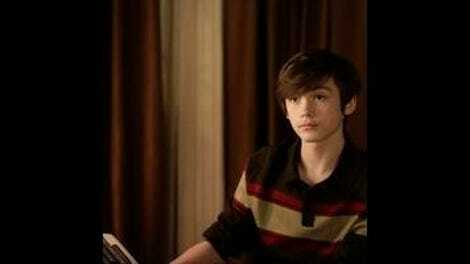 He’s Grant Andrews, a.k.a. Andrei Chernin, a Russian spy working for the shadowy organization known as DVX. Even when the Jennings aren’t watching The Day After or David Copperfield, their viewing choices still say something about them. Outlandish theory time: The games Henry plays on the computer (which was provided by The Centre) are a combination Soviet training/recruiting tool. And even if that’s not the case: Sending Henry to go digging through the garage for electronics is a Bad Idea. William’s last name is Crandall? I’ve been calling him “Krabappel!” Why didn’t someone tell me? Oh, I’ve been making an idiot out of myself! Of course the mob was used as cover for the Mail Robot operation: Frank Langella sounds every bit the imposing mafia don when he tells William “You’ll do this one last thing” in that leonine purr of his. Paige retroactively takes back her appreciation of Matthew’s musical efforts: “Do you still have your band?” “No, we weren’t very good.” “No, you weren’t.” Don’t be so hard on yourself, Matthew: “Mississippi Queen” sounds kind of crummy even when Mountain is playing it.